Vancouver's Ray Condo passed away in April of 2004. A consummate performer who made western swing a central part of his repertoire, Ray had a history of heart problems, which he (only too characteristically) ignored. Ray Condo lived in the moment, and while that meant that on a few occasions his performances veered towards chaos and disaster, it also gave him the power to galvanize a nightclub full of strangers, and to communicate full force his love of the music he performed. A Ray Condo show was usually a joyous celebration; the best ones made you feel you were at the center of the universe, that there was no place in this world where you would rather be. Born Ray Tremblay in Hull, Quebec, he grew up in a large family that loved country music. His first experience as a musician came in a Vancouver New Wave rock band, but by the mid 1980s he had moved to Montreal, and back to his musical roots. 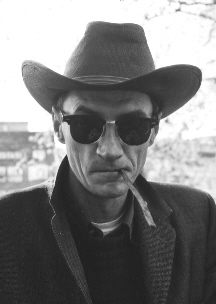 Ray Condo and his Hard Rock Goners started with Hank Williams and then moved on, performing rockabilly, jazz, blues, country and western swing with wild abandon and unabashed enthusiasm. In the early 1990s Ray returned to Vancouver, and joined with members of Jimmy Roy's Five Star Hillbillies (Jimmie Roy-steel guitar; Stephen Nikleva-guitar; Steve Taylor-drums) and Goners bassist Clive Jackson to form Ray Condo & the Ricochets. Though it would later lean towards rockabilly and honky tonk country, in the beginning this band was fully committed to a small-group western swing approach. Ray's vocals and the twin guitar and sax front line combined with a crack rhythm section to produce some inspired and swinging music, both on record and in live performance. The band enjoyed sufficient renown to tour constantly throughout North America, and to regularly visit Europe. Western swing and rockabilly has small pockets of fans spread from Tokyo to Helsinki, from Whitehorse to San Antonio, and going out to play for them usually means a long series of one night stands reached by driving in a van packed with gear and musicians, often with 500 miles or more between the gigs. This kind of touring will wear down a healthy person, and Ray's health was never the best. He finally quit the road, performing locally while working for CP Rail. Ironically, the band was preparing to tour again, with shows booked around the world, when Ray was struck down. I have many fond memories of watching Ray perform: great nights in small local bars, high energy shows on big outdoor sound stages, and a few strange ones as well (like the band's appearance on a Polish TV variety show!). But the one that comes most often to mind was his last, two nights at The Balmoral Hotel, in the heart of Vancouver's skid road. This was something of a salute to the early 1980s, when local rockabilly and western swing bands often played in such venues. As in the old days, the shows attracted a crazy quilt audience: local residents, rockabillies, native Indians, swing dancers, bikers, and punks. And Ray Condo somehow reached every last one of them with western swing, whether they knew what that was, or not. So long Ray; we sure miss you. Ray Condo and his Hardrock Goners released their first LP, "Crazy Date", in 1986, on Pipe Dream Records. Their second LP "Hot'N'Cold" was released in 1988 on their own label, Crazy Rekkids. Then in 1990 they released their third LP "Condo Country", again on their own label. In 1991, "Condo Country" was released as a CD, including some tracks from the first two LPs. 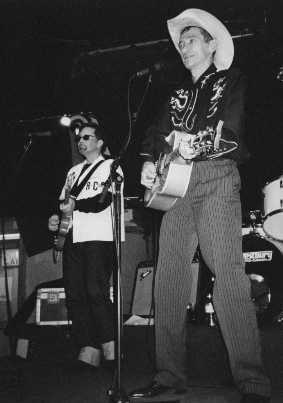 In 1992 Ray and the Goners were invited to play at the rockabilly revival festival Hemsby, for which Fury Records in England released a 4 song EP, called, "Condo Country". Reaction to the band was very good, and so in 1993 Fury Records released a CD, "Hillbilly Holiday", with songs recorded for the first 3 LPs that had not been released on the "Condo Country" CD. The band toured Europe in 1993 to support "Hillbilly Holiday". Fury Records then asked the band to record some new material, and that led to 1994's CD "Come On". After that Ray formed a new band in Vancouver, the Ricochets, recording 3 CDs with them, and touring extensively on the west coast and throughout the States. Photographer Gayle Hurmuses Memorial website to Ray Condo. You can order Ray Condo and his Hardrock Goners CDs from the Crow-Matic Records Store.